The Large Millimeter Telescope during construction. The Large Millimeter Telescope (LMT) is a 50-meter-diameter (164-foot) millimeter-wave telescope – the world's largest for use in this region of the spectrum. It is designed to operate mainly at wavelengths of 0.85 to 4 millimeters. 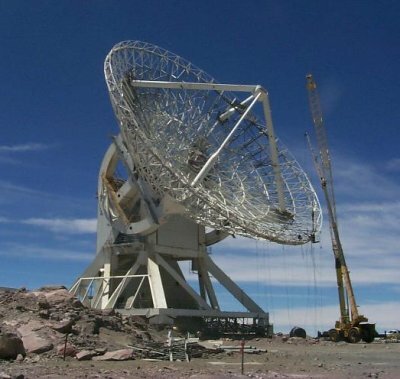 The Large Millimeter Telescope is a joint project of the University of Massachusetts at Amherst and the Instituto Nacional de Astrofísica, Óptica, y Electrónica (INAOE) in Mexico. Built at a cost of $120 million, it stands at an altitude of 4,580 meters (15,026 feet), on the summit of Sierra Negra, Mexico's fifth highest peak – an extinct volcano in the state of Puebla. The LMT was inaugurated by Mexican President Vicente Fox in November 2006 and was scheduled to begin scientific operations in 2008.